The idea of a universal human language goes back at least to the Bible, in which humanity spoke a common tongue, but were punished with mutual unintelligibility after trying to build the Tower of Babel all the way to heaven. Now scientists have reconstructed words from such a language. The ancestors of people from across Europe and Asia may have spoken a common language about 15,000 years ago, new research suggests. Now, researchers have reconstructed words, such as “mother,” “to pull” and “man,” which would have been spoken by ancient hunter-gatherers, possibly in an area such as the Caucusus. The word list, detailed today (May 6) in the journal Proceedings of the National Academy of Sciences, could help researchers retrace the history of ancient migrations and contacts between prehistoric cultures. “We can trace echoes of language back 15,000 years to a time that corresponds to about the end of the last ice age,” said study co-author Mark Pagel, an evolutionary biologist at the University of Reading in the United Kingdom. 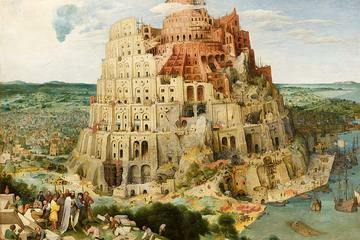 Pagel, however, wondered whether language evolution proceeds much like biological evolution. If so, the most critical words, such as the frequently used words that define our social relationships, would change much more slowly. To find out if he could uncover those ancient words, Pagel and his colleagues in a previous study tracked how quickly words changed in modern languages. They identified the most stable words. They also mapped out how different modern languages were related. They then reconstructed ancient words based on the frequency at which certain sounds tend to change in different languages — for instance, p’s and f’s often change over time in many languages, as in the change from “pater” in Latin to the more recent term “father” in English. The researchers could predict what 23 words, including “I,” “ye,” “mother,” “male,” “fire,” “hand” and “to hear” might sound like in an ancestral language dating to 15,000 years ago. In other words, if modern-day humans could somehow encounter their Stone Age ancestors, they could say one or two very simple statements and make themselves understood, Pagel said.